When sliding glass doors, as shown in Figure 1, were first introduced into the market, they were the rage. Sliding glass doors were installed in family rooms, dining rooms, kitchens and on bedroom balconies. The intent was to bring the outdoors indoors. That was also the time when the cost to heat and air condition homes was far from expensive and the fact that the sliding glass doors did bring the outdoors in, including cold and hot air wasn’t really a downside. 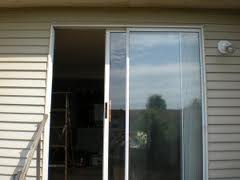 However, now that energy costs are rising year in and year out, having old sliding glass doors that require you to place towels below the door frames to keep the cold air out or even cover the doors with plastic in order to keep the warm air in your home in, replacing those old sliding glass doors with energy efficient doors is an excellent home improvement. It will save on energy consumption and put dollars into your pocket. Secondarily, the old aluminum frame sliding glass doors were really not aesthetically pleasing. With modern technologies you can replace those old sliding glass doors with products that will enhance the appearance of your home both inside and out. Modern sliding glass doors can be purchased with aluminum, steel or vinyl frames, as shown in Figure 2, in an assortment of colors and finishes. They are energy efficient and most come with tempered glass. The glass portion can be one clear pain or made to look as if there are a group of smaller window panes. The major advantages of sliding glass doors is that they do not take up living space when opened and they generally come with a sliding screen so that you can allow fresh air into the home when outdoor temperatures are comfortable. 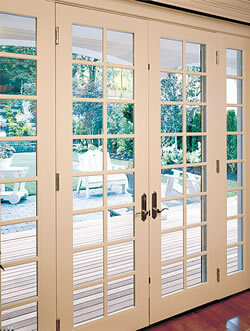 Double hung exterior French doors, as shown in Figure 3 can be used in place of a sliding glass door. With like quality, French doors generally provide better energy efficiency than sliding glass doors, as the design makes it easier to add weather strip in order to seal any gaps. The major disadvantage to French doors is that they open in and hence they need a fair amount of open space in front of them. In smaller rooms this may present a problem. French doors generally do not have screens fitted, hence in most areas, where flying insects are a problem leaving the doors open to obtain fresh air is usually not a consideration. A patio door, as shown in Figure 4, looks just like a double hung French door and unless you take a very close look at the doors you will not be able to tell the difference. 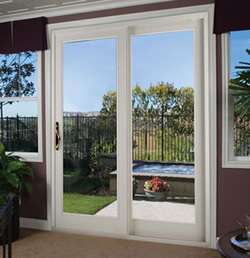 The only difference between a patio door and a double French door is that the one of the doors on the patio door does not open; it is for aesthetic value only. The fact that only one door opens is an advantage for energy efficiency, as it is only necessary to provide weather strip to one door as the other door is fixed and air tight. 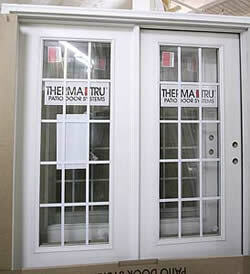 Note: The terms sliding glass door, patio door, and exterior French doors are often interchanged. Before you order your sliding glass replacement door make sure that you fully understand what style door you want and make sure that the terminology you are using describes the door you will receive. If you purchase the exact same size replacement sliding glass door and frame then installation is not overly difficult and most handymen should be able to undertake the installation with a helper, because the sliding glass doors in their frames are heavy, without too much difficulty. Correct measuring is the key. Remove the internal door frame trim around your current sliding glass door and measure the height and width of the frame. When the replacement door arrives, remove the current doors from the frame. Remove any exterior trim, carefully, as you will probably want to reuse it, which is around the current sliding glass door frame. 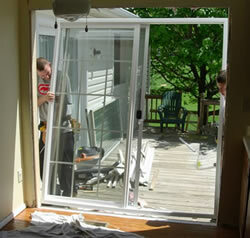 Remove the old sliding glass door frame. You now have the rough-in opening for your replacement doors. Install the new replacement doors and frame, as shown in Figure 5, using the door manufacturer’s instructions. Replace the exterior and interior trim. Note: You may have to add some additional insulation between the new door frame and the rough-in lumber.